Why Build a Web Application? Does Every Business Need a Web Application? Web applications are getting more and more popular, but in 2018, what’s the best way to build one? The answer is: it depends on your needs. In this guide, we’ll cover the best tools and lessons learned for building web applications without a developer. If you’re not quite sure what a web application is and how it’s different from a website, that’s okay. I’ll cover that in detail in this guide. If you are more experienced in web applications, and you’re just interested in learning best practices, jump right down to the section “Things to Consider When Building a Web Application”. If you already have experience building web apps, but you’d like to learn about the best tools available for building them without code, head on down to “Tools for Building Web Apps Without Code”. A web application is software that users can access from their web browser. But, I’m getting ahead of myself. Before we get too deep into how web applications work, it’s important to understand what a web application is and why yu might need one for your business. You could broadly put all websites on the internet into two categories: web pages and web applications. While the distinction is getting harder and harder to discern, typically web pages are static, read-only websites designed to distribute information in only one direction. Web applications on the other hand are dynamic, two-way information distribution and gathering systems. For example, if you’ve made a profile on a website like About Me, you’ve created a web page, not a web application. 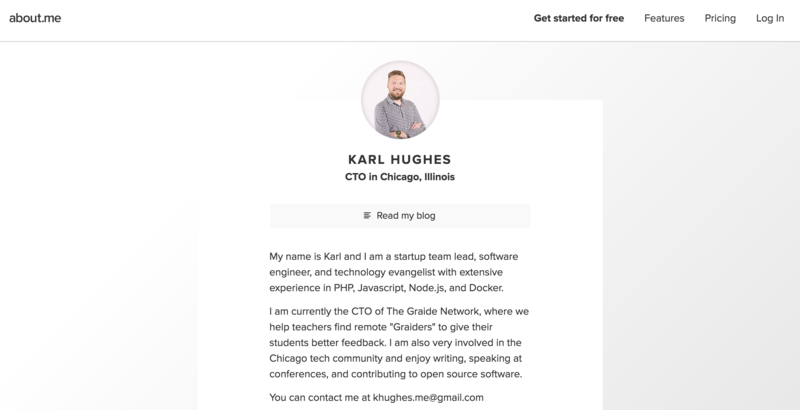 This profile looks nice and allows readers to learn and find more information about you, but it’s not a two-way conversation. Readers can’t interact with your profile, ask questions, or make requests. My About Me web page at about.me/karllhughes. Draw.io on the other hand is clearly a web application. When you open up the site in your web browser, the interface looks more like a desktop drawing program than a typical website, and you can both read information on the site as well as create and save your own drawings. Draw.io is clearly a web application, not just a web page. Most websites are probably a little bit web page and a little bit web application, so again, don’t get too hung up on the distinction. As we look at more examples, it should be clear whether or not you need a web app or just a web page for your business. 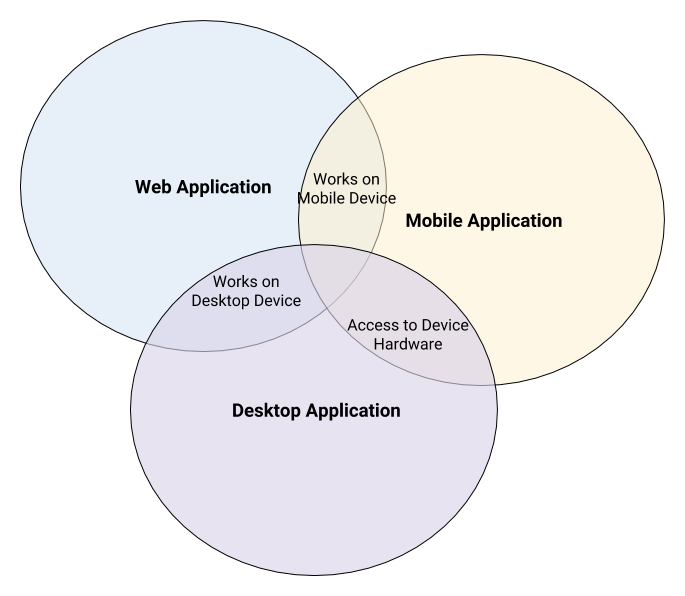 Another important clarification to make before going any further is the difference between a web application, desktop application, and mobile application. While all three forms of software can be used to accomplish most of the same things, the big difference is how users access the application. Web apps are meant to be accessed in a web browser, mobile apps are meant to be downloaded and used on a mobile device (eg: smart phone or tablet), and desktop apps are meant to be downloaded and used on a computer or laptop. This difference in how the apps are accessed gives the software access to different built-in hardware and software on the device. This means that mobile and desktop apps have access to the device’s built-in GPS, accelerometer, camera, Bluetooth connection, and much more, while web apps have very limited access to all these features. I don’t want to get too technical, but this means that if you want to build software that connects to a Bluetooth watch through a user’s smart phone, you’re probably going to need a mobile app, and if your software needs to use a CD drive, you’ll need a desktop app. These limitations may make you wonder why anyone would build a web app, but the truth is that there are a lot of advantages to building a web application. We’ll cover these advantages in the next section. One of the biggest reasons to building a web application rather than a desktop or mobile app is that web applications can be built once and accessed everywhere. With a desktop app, you have to consider that some users have a PC and others use Mac. Each operating system works differently, so programmers have to build two versions of your software. The same is true of Android vs. iPhone software - very little can be shared between the two platforms. That’s not the only reason though, so let’s take a look at some other reasons people choose to build web apps over desktop or mobile ones. The same web app can be used on a smart phone, PC, Mac, or any other internet-connected device. You don’t have to ask users to update their software. When you want to make an update, you just update your web app and users automatically get the latest version next time they visit. Web browsers have more functionality than they used to. In fact, you can now use push notifications, access a user’s camera, read GPS location, and more using only a web application. There are many great cheap or free tools for building web applications without code (see “Tools for Building Web Apps Without Code” below). All this leads to the biggest takeaway for non-technical founders: web apps are an order of magnitude cheaper to build and maintain than native mobile or desktop applications. This makes them great for MVPs, but the truth is that a web app may be all you ever need. Let’s look at some examples of established startups and businesses that leverage web applications to serve their software. You’re probably using several web applications on a daily basis, but it’s worth taking a look at a few of the most popular web applications out there. There was a time when email clients were mostly stand-alone programs that you installed on your computer - think Outlook or Apple Mail - but Gmail changed all that. 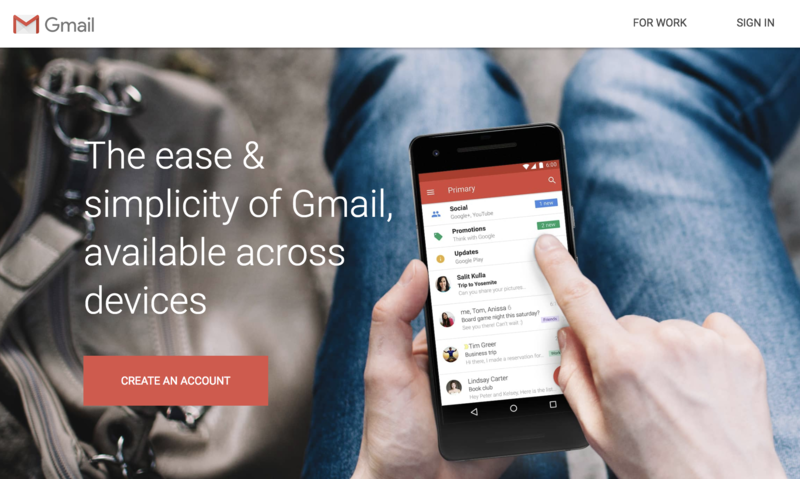 Google’s email client is available for free on the web, and if you also use their mobile app, it stays in sync with the web version. This is a great example of a company using both a web and mobile app to great success. Slack is a free team chat tool that’s available as a web app, a mobile app, and a desktop app. While most users might default to the mobile or desktop apps, it’s nice to have the option for web access in case they need access from a shared computer. Slack has taken advantage of the latest browser features (like camera and notification access) to make the web experience as close to the native experience as possible. Note-taking apps are all over the place, but Evernote is probably the best one available. 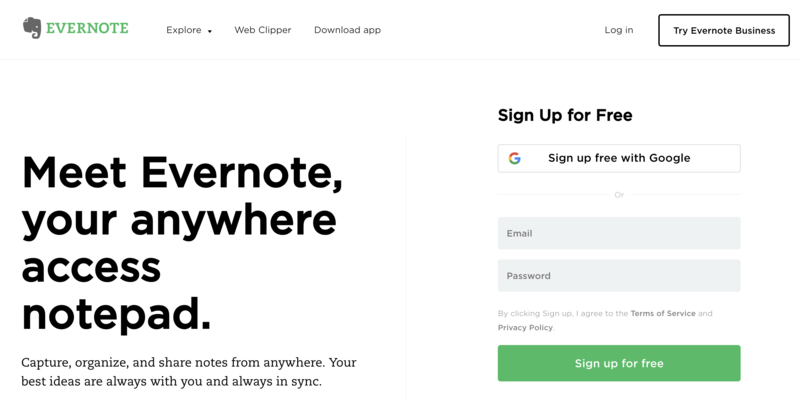 Like Slack, they offer native mobile applications, but their web experience is almost as full-featured as the mobile or desktop one. The big downside is that the web application isn’t going to work when you’re offline like the desktop version would. While pretty much every company needs a website these days, the truth is that some businesses don’t need a full-blown web application. Businesses with physical locations may not need to have an online store, some startups only offer a mobile app, and many B2B (Business-to-Business) service providers (like consultants) don’t need a web app. Every company is different, but another way to decide whether or not a web application is worth it is to look at competitors in your industry. If most of them do not have a web application, it’s likely you can start without one as well. Web applications are much easier and cheaper to build than mobile or desktop applications, but they still require some foresight into the way users will access them, how data will be retrieved, and what triggers need to be kicked off. You can’t ignore the fact that your web application may require users to input sensitive information like their credit card or email address, so you need to think about security as well. Here are just a few of the considerations you should take into account when building a web application. Who needs to have access to your web application? Will you just use it internally or will customers need their own logins? How will users do basic account maintenance like change their email address or reset their passwords? Where are your passwords going to be stored? Do different users have different levels of access? There is a lot to think about here, so user logins and permissions can be much more complicated than you would think. Many web applications support online purchases, but be careful with this. If you want to store and process credit cards, you will have to spend tens of thousands of dollars on securing your system for PCI compliance, and that can break a new business! Instead, most startups rely on third party payment processors like Stripe and Paypal to handle purchases. Where will you store private user data? Who in your company will have access to it? What happens if this database is breached or data stolen? Would you even know? These questions and more are necessary prerequisites before you get too far into building a web app. Good security can be expensive, so try to rely on professional quality tools rather than building solutions yourself. Do you need to track how users are using your application? Do you want alerts when users encounter an error or when your site is down? Can users self-service problems or do they have to report them to you? Thinking about these “edge cases” up front and having a plan can greatly help the usability of your web application. 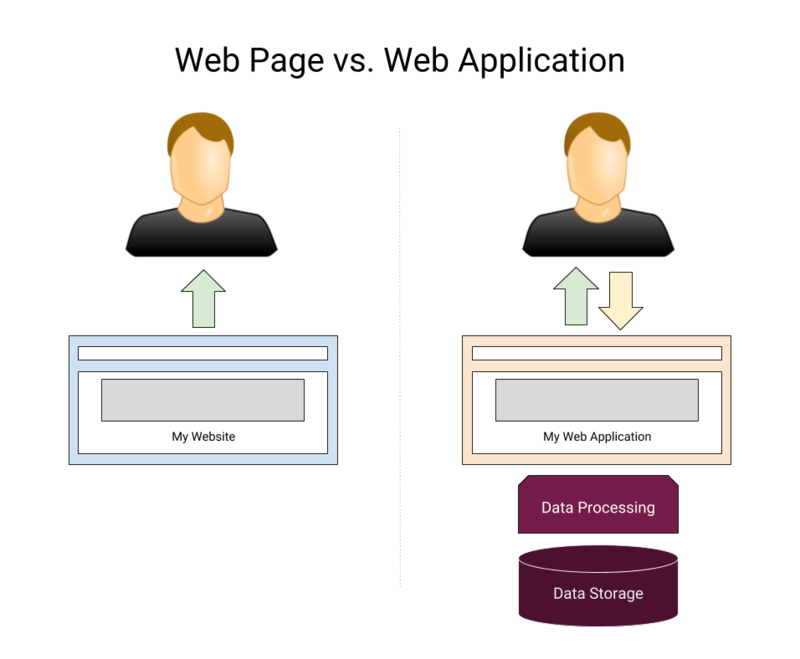 At their core, most web applications take data as input from users, process this data, and then present some form of output (usually visual). The “process this data” step often involves side effects; for example, when users submit an order, you may want to be notified with an email or Slack notification. Sometimes what users do affects how other users see your web app. These side effects need to be handled somewhere, but if your web app’s code can’t do it, another method is to use a tool like Zapier. How many users does your website need to support at once? While you may want to be cautious and build something that can serve thousands of visitors at once, this kind of high-scale web application can cost a lot of money and be very hard to build. Likely you can get away with starting at a few hundred users and growing as your traffic does. Either way, you should know how big of a scale you’ll be operating at as this might influence the type of web application you want to build. Finally, do your users care about speed? While it’s common knowledge that a faster website will sell more products, there’s a practical limit to this too. Designing a super-fast website may cost you more than you can afford at this early stage in your product’s life. The most obvious to end-users of your web application is the user interface. Usually this is a visual interface (like this website), but your web application could be voice controlled, API-based, or even just a bunch of files that users can download. The important thing with any user interface is that users can send and receive information through it. The item ordered needs to be pulled from a warehouse shelf, boxed up, and passed off to a shipping service. The customer’s credit card should be charged the correct amount and sent a receipt. The item should be added to the user’s order history. Ads for suggested items should be updated based on this order. After or during the data processing phase, it’s likely that some of this user input data should be stored for retrieval at a later date. Data storage isn’t as simple as just putting everything in a spreadsheet though. Sometimes web apps have to store certain data for regulatory compliance, sometimes they are not allowed to store certain data, and sometimes there are regulations about how certain data can be stored. When a web app gets really large, data storage, caching, and recovery can become very complex as even the fastest computers have a hard time searching millions of rows of data quickly. Description: Wordpress has been around a long time, and it now powers millions of websites including massive ones like CNN and Tech Crunch. While it used to be just a blogging engine, it’s grown to be much more thanks to thousands of free plugins and themes built by developers. The power of Wordpress is in its flexibility though as even small businesses can successfully use Wordpress, and founders without a developer can go a long way without ever editing any code. Description: Bubble is probably the best web application builder I’ve seen for those who don’t code. You can use Bubble as your data storage or hook it up to an existing database or import data from a spreadsheet, kick off notifications when data changes, and handle user accounts and logins with ease. They even offer a mobile app builder if you want to expand your web app in the future. Description: I’ve started using Airtable for almost everything that I used to pack into spreadsheets. While Airtable is more of a spreadsheet and data visualization tool, you can embed Airtables into your website and users can submit responses right in Airtable too. If you need side effects or extra data processing, just hook it up to Zapier. Can use with Zapier to trigger events in other services, send emails, etc. Description: Shopify has become the standard for small, standalone eCommerce stores. If the primary goal of your web application is to sell physical products, Shopify is probably the easiest and best option. Fpr inspiration or to see what’s possible, check out the examples on BuiltWithShopify. This guide will continue to evolve and grow as new tools and information becomes available. If you have your own suggestions, feel free to suggest improvements on Github or send me an email directly. If you want more great stuff like this sent to your inbox every week, then sign up below for our email newsletter.